Our Kansas City Eye Clinic doctors have a proud history of fitting their patients with the highest quality general and specialty contact lenses. In the last few years, the contact lens industry has made significant advances in contact lens materials and designs to accommodate almost any condition. These fantastic technological benefits ensure even better and safer visual eye health benefits. Our doctors take into consideration your lifestyle, motivation, refractive error, and ocular health to recommend the best type of contact for your eye. Experience and research has shown that the most important factors in contact lens success can be attributed to the specialized examination, lens design, instruction and long term and regular follow-up care that our qualified, registered and experienced contact lens practitioners provide. We offer personalized customer service with a high quality product. There are two major categories of contact lenses, hard and soft. Hard contact lenses include the original PMMA plastic lenses (which are rarely used today), rigid gas permeable (RGP lenses), and scleral lenses. Soft lenses include a variety of options including; daily wear and extended wear, disposable wear (1-day, 2-week, or monthly), colored lenses, bifocals, and toric lenses to correct astigmatism. 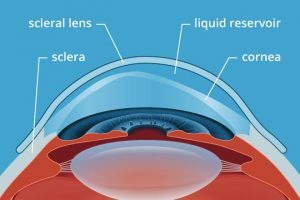 A hybrid lens is has a soft skirt on the outside with a hard lens in the center for a more comfortable fit, but still maintaining optimal vision through a hard lens. We would be happy to discuss the best type of contact lenses for you and your lifestyle at a Contact Lens Evaluation. Please call (913) 341-3100 or request an appointment to schedule your Contact Lens Evaluation with any of our optometrists. Stephen L. Nichols, O.D. Rebecca D. Nichols, O.D. Dawn T. Bircher, O.D. Claire E. Fisher, O.D. These “medically necessary” contact lenses are not the same as “cosmetic” contacts. Cosmetic contacts are elective and not covered by medical health insurance. However, medically necessary contact lenses are sometimes covered by insurance, dependent upon your plan. There are several different types of specialty contact lenses available depending upon your condition and the shape of your eye. The doctors will evaluate you and determine the best option for vision correction and comfort based upon your exam. Hybrid contact lenses have a hard center and a soft skirt around the outside. This allows the patient to have the vision of a traditional rigid gas permeable lens, but the comfort of a soft contact lens. Scleral contact lenses are larger than the traditional RGP. They sit on the “white” part of the eye called the sclera and vault over the entire cornea. This allows for greater stability, comfort, and better vision. The EyePrintPRO Prosthetic Shell is the newest available option for patients who have had a difficult time with traditional contact lenses. It is a custom prosthetic device that is made from a mold of the patient’s eye and manufactured specifically to match the exact contour of that individual eye using the latest technology in 3D scanning. Prescribing medically necessary contact lenses can be a long, difficult, expensive, and frustrating process. Every patient is different, and it may take several attempts to find a lens design that works well with the shape of the eye. The goal of visual rehabilitation is to achieve optimal vision, provide comfort and tolerance to the device so it can be worn all day, and to accomplish both of these first two goals without compromising the health of the eyes. If you have been diagnosed with a corneal disease and would like an evaluation for a medical contact lens, please call 913.341.3100 or request an appointment with Dr. Nichols or Dr. Bircher. We are dedicated to providing the highest level of contact lens service to our patients. For this reason, we offer complete contact lens care which includes materials and professional services. Contact lenses are medical devices which must be evaluated and monitored for the health and safety of you and your eyes. All contact lens patients, new or existing, require exam testing and measurements in addition to the regular exam. Your contact lens Evaluation Fee covers this additional testing, as well as your subsequent contact lens appointments and services for 90 days from the initial evaluation. In additional to an ocular health exam, the process of evaluating and fitting first-time contact lens wearers includes a training session with a Contact Lens Technician for the insertion, removal, and proper care and maintenance of these devices. Current contact lens wearers will be evaluated on the current fit, wear, and vision in their contact lenses and additional testing will be completed before dispensing new contacts. It is important for your health and safety that you follow the care and maintenance instructions for your contact lenses and adhere to the follow-up schedule set by your doctor. A contact lens prescription is not complete until the patient has finished the evaluation and fitting process. All contact lens prescriptions are valid for one year from the date of issue.